Well, this is a surprise. VGM dance remix albums have been a dime a dozen lately, with Space Invaders 2008, Konami Addiction, and Final Fantasy Remix all coming out within the past year. Up until now most of these remixes have been of the electro or techno variety. Avex are about to change that, however, with the release of Dragon Quest Best Dance Mix. Leave it to Avex to finally release what I’ve been dreaming of for so long: VGM trance. 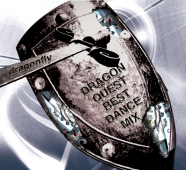 Dragon Quest Best Dance Mix will be produced solely by the trance artist known as DragonFly. According to his profile, he first got a synthesizer when he was 18 years old. At the age of 21 he released an album on iTunes featuring eight original songs as well as two Dragon Quest remixes. You can listen to one of those DQ remixes, “Overture,” on his MySpace. “Overture” sounds okay but I think his other tracks are more promising. “Yo! Kabuki” in particular is my favorite of the bunch. I’ve long been a fan of wafuu fusion (wafusion, if you will) styles, so I hope he also implements traditional Japanese instruments in his new DQ remixes.